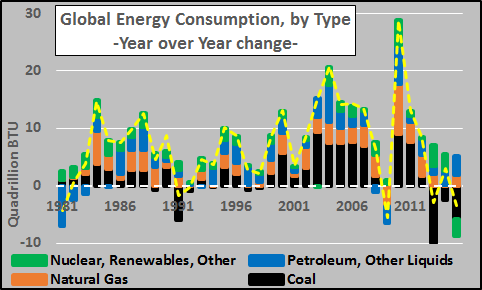 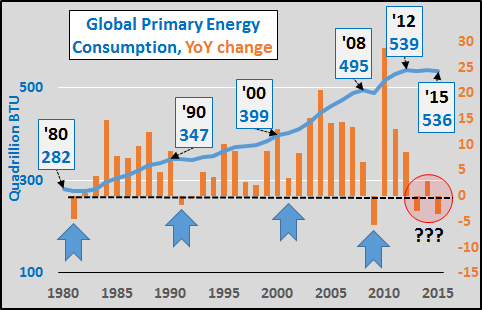 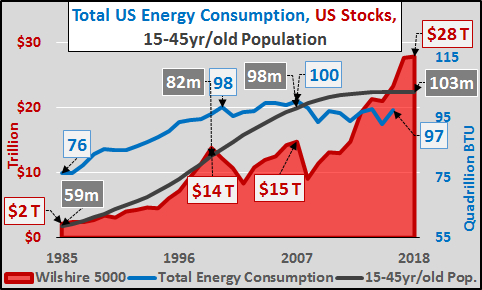 Once upon a time, skeptical analysts cross checked stated growth versus energy consumption...looking for discrepancies as fluctuations in energy consumption are a good proxy for the changes in real economic activity. 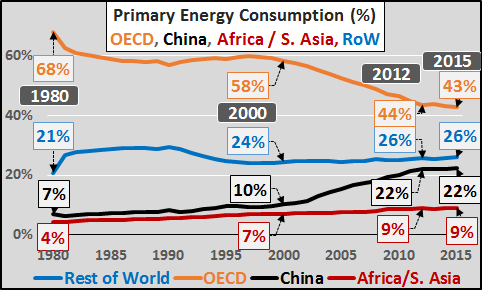 The 35 nations that make up the OECD represent 17% of global population but 43% of total primary energy consumption. 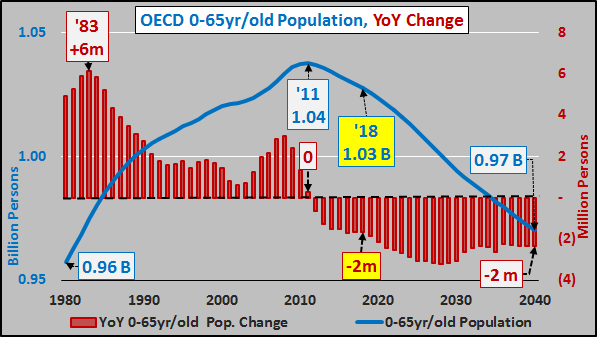 The OECD core population is now outright declining and by 2040, is estimated to see a 6% decline (this estimate includes and relies upon ongoing immigration at current levels). 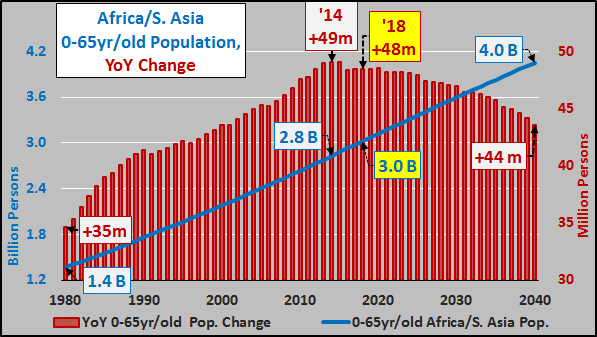 This is also assuming birth rates and fertility suddenly, and unlikely, surge as the UN and Census have been wrongly projecting ever since 2008. 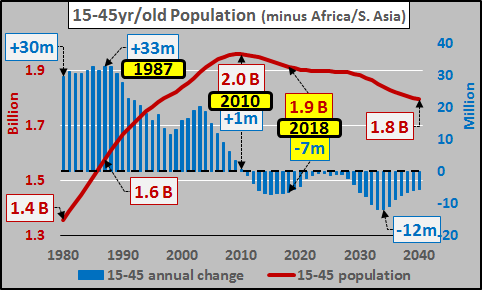 However, assuming birth rates and fertility continue their decade plus downward trend &/or immigration wanes, even more significant declines will ensue and the under 65yr/old population will be below the mid 1980 levels by 2040. 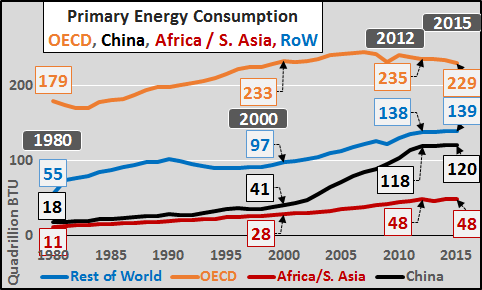 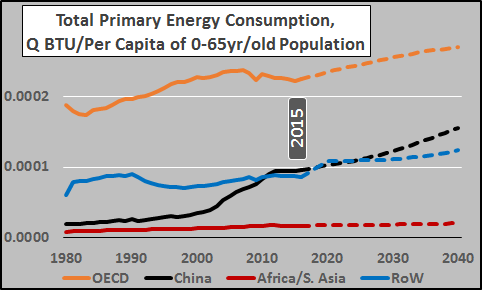 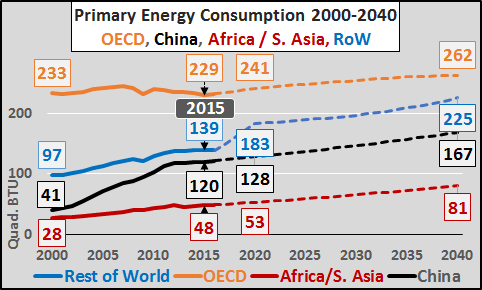 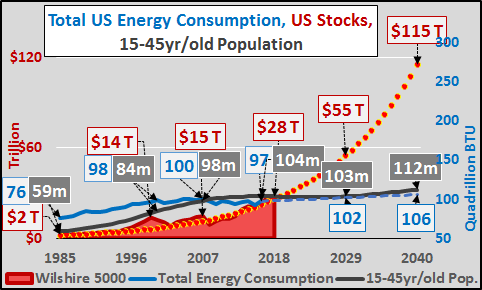 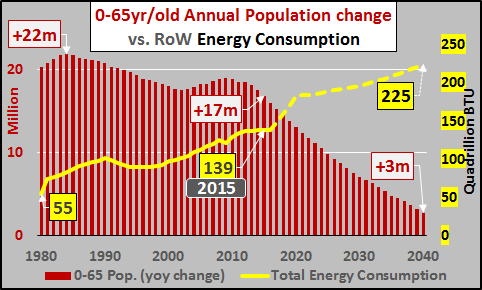 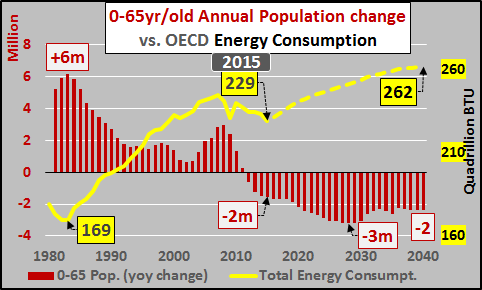 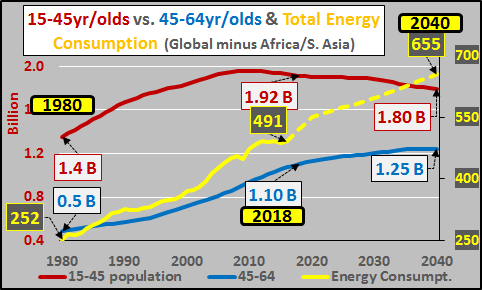 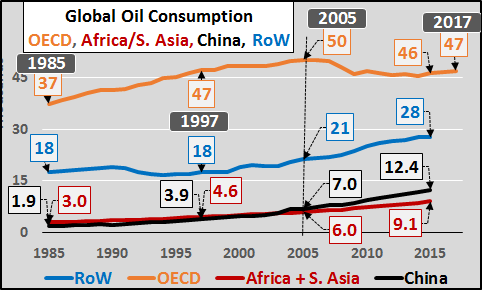 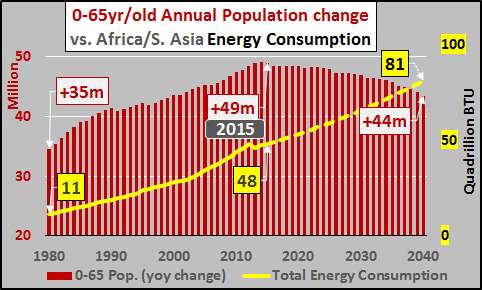 OECD annual 0-65yr/old population change versus OECD actual and projected total energy consumption (chart below). 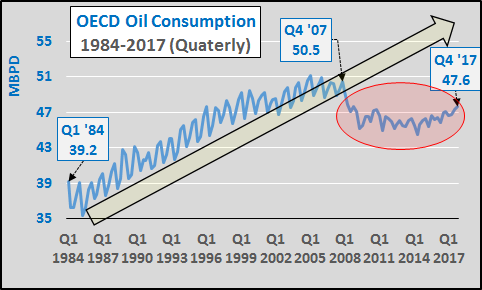 Despite the 50%+ fall in energy prices since peak consumption (way back in '07), OECD demand continues declining but is continually estimated to suddenly reverse and begin rising again by the EIA?!? 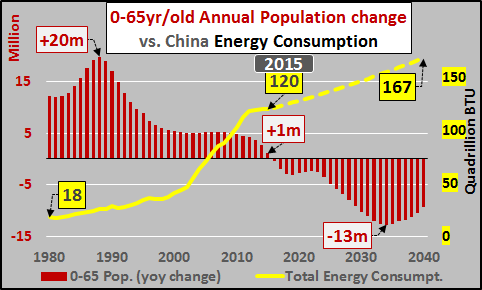 A secular decline of the population and energy consumpttion is underway and is likely to continue indefinitely. 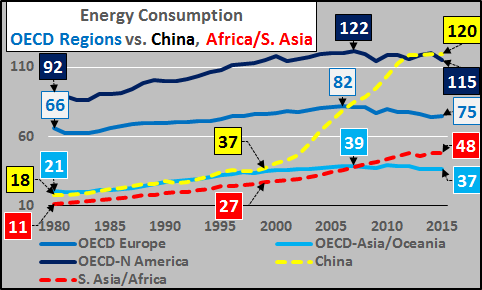 The chart below is the best case (economically speaking) for the world (excluding Africa/S. 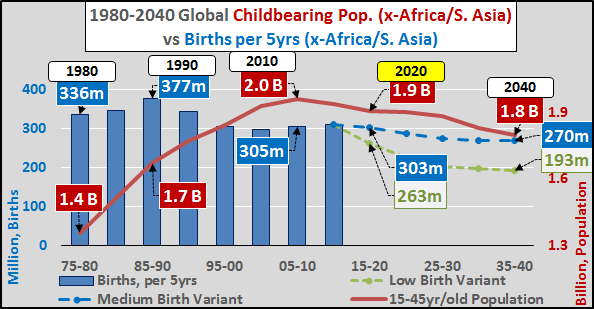 Asia), assuming the medium variant of births through 2100. 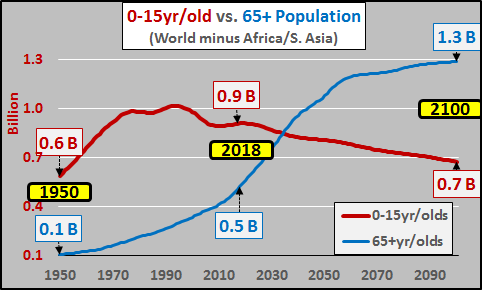 The UN estimates that the 65+yr/old population will nearly double the 0-15yr/old population by 2100. 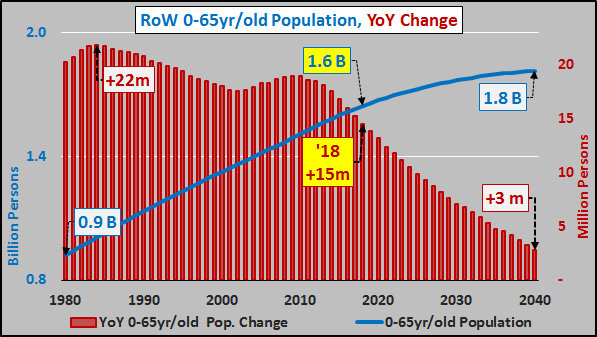 This inversion of the population pyramid simply can't and almost surely won't happen given the reliance of the elderly on the young. 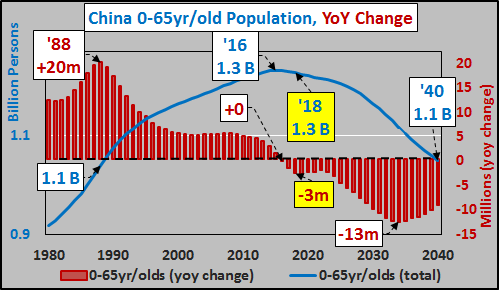 A near term "course correction" will almost surely intervene and the reality will be a far lower 0-15yr/old population and honestly...I can't hazard a guess as to what will become of the 65+yr/old population.